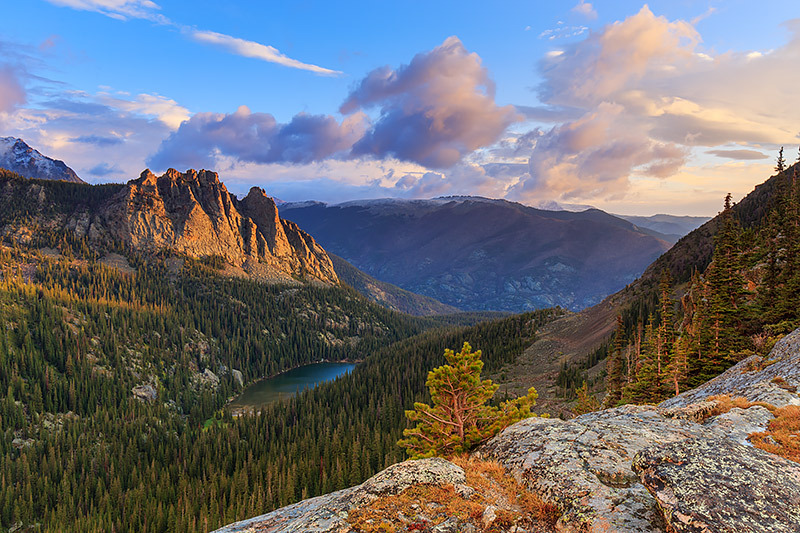 Anyone who has been lucky enough to hike from Bear Lake to Moraine Park may have wandered up the social trail on the side of Joe Mills Mountain to take in this impressive view. High above Odessa Gorge there is this impressive view looking back down onto beautiful Odessa Lake that is one of my favorite viewpoints in all of Rocky Mountain National Park. I made this image late in the summer. The season were quickly changing and snow had fallen on the high peaks the night before. As the sun rose, the clouds lifted from the peaks and the Gable bathed in the warmth of the morning sun over Odessa Lake. Photo © copyright by Thomas Mangan.